Solar powered sid signs; permanent or portable formats. Solar powered speed signs allow you to harness natural energy emitted by the sun. Used to assist recharging of the on board battery(ies) solar panels can make a big difference to the frequency at which manual mains recharging is required. 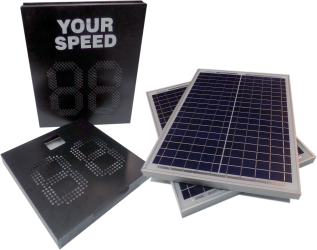 The solar panels used on your speed sign display are rugged, A grade product sourced direct from the manufacturer. Instead of sourcing solar arrays as and when they are ordered by customers we buy in bulk and hold our own stock. This approach ensures consistency of panel quality, unit price and supply. 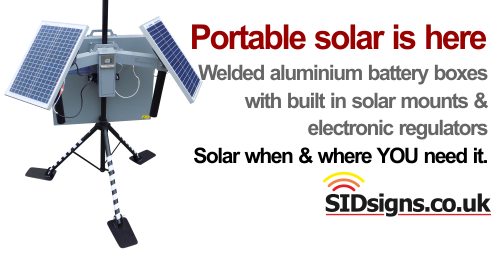 If you want a sid display which uses solar panels we always have plenty available. 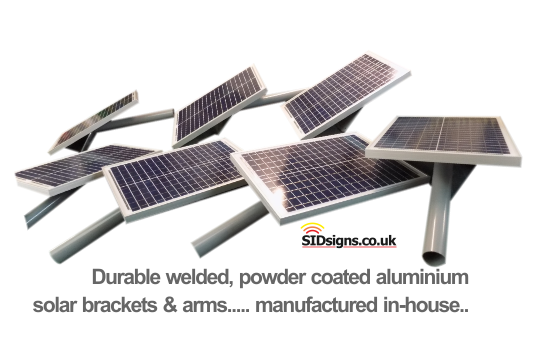 Solar powered sid signs feature brackets and mountings which are all manufactured in house from 5mm thick aluminium plate tig welded to a variety of tube or box section profiles. Aluminium allows you to have a, substantial, secure mounting system which is also lightweight and easy to handle. Finished with polyester powder baked on at high temperatures an aluminium solar mounting system never rusts, never deteriorates. Safe, secure, permanent. Custom mounting, extra long arms or different coloured finishes; whatever you need we can make it for you. Most of the solar powered sid signs you've seen are probably bolted onto posts at the side of the road. This isn't the only way you can use them. Newly designed battery boxes for both lead and lithium batteries now allow you to use solar panels to assist the charging of portable & temporary speed sign installations. For some project we've even made solar A-boards; independent, freestanding power panels. One great big solar panel or a series of smaller photovoltaic arrays; which one should you choose? Using large solar panels means your sid sign can't be moved very easily, it can also place an uneven wind load on any metal post you mount it to. You also have the problem that the panel is locked to one position, one direction. As we all know the sun moves across the sky during the day meaning a fixed panel always has a narrow peak performance window. Rather than one giant panel why not use several smaller panels to deliver the same generation capacity? This is the approach we use for our solar powered sid sign systems. Small arrays which can be pointed in different directions; South, West, East for example. On a quiet road? don't need much solar generation capacity? There is no need to waste money on more capacity than you need. Want to boost your recharge rates? Add more panels as and when you need them. Got to move your sid display? It's easy when you're working with small, lightweight photo voltaic structures all manufactured from aluminium alloy. Single, twin tented or any combination of; assembling the most effective small panel array is easy. Sealed lead acid and lithium ion batteries use specific recharging technologies which don't mix or match. Stock of solar regulation devices for both storage types are kept so you can quickly get access to the solar recharging you need.